With this post I will close the chapter on Awataguchi and after introducing some works of the more or less “also ran” smiths of the school who have not been introduced so far, I want to add some concluding thoughts on why the school did not make it into Nanbokuchô times. As for Awataguchi Kunimitsu’s extant works, there are two tachi which are famous, a jûyô-bunkazai that is preserved in the Yôrô-ji (養老寺, Gifu Prefecture), and a jûyô-bunkazai that is owned by the Kurokawa Institute of Ancient Cultures. 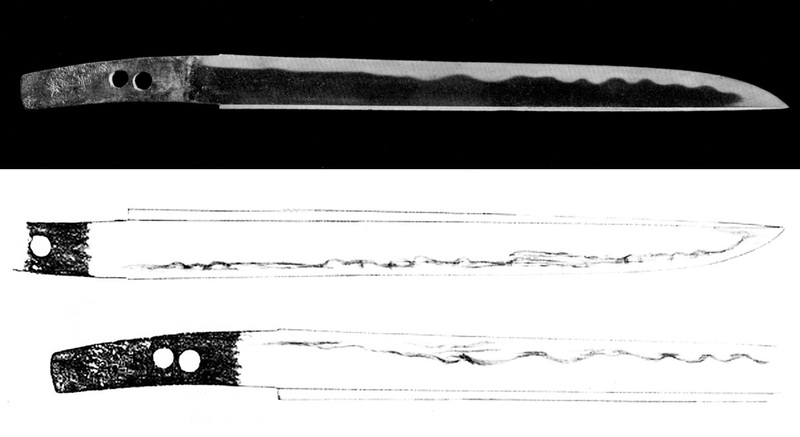 Both blades are slender, elegant, show a relative shallow sori, traces of funbari (both blades are surage), a rather wide shinogi-ji, and a ko-kissaki that tends towards chû and a hint towards ikubi, a feature that was popular in mid-Kamakura times. Also the interpretation of the jiba is very similar. We see a densely forged ko-itame with fine ji-nie and a nie-utsuri, a ko-nie-laden hoso-suguha with a rather wide nioiguchi, and a ko-maru-bôshi with a relative wide kaeri. The former, i.e. the Yôrô-ji tachi shows a few ashi and seems to be a little more nie-emphasized as there are some chikei and kinsuji. The interpretation places the two blades perfectly into the principal stylistic approach of the Awataguchi school. Picture 4 below shows the aforementioned tantô of Kunimitsu. It is quite graceful and has lost some substance – leaving only traces of the once engraved suken on the omote and the gomabashi on the ura side – but with the jiba very well preserved. The kitae is a ko-itame with masame-nagare that features plenty of ji-nie and fine chikei and the steel is extra bright and clear. The hamon is a ko-nie-laden suguha with a little notare that is mixed with a little ko-gunome on the ura side. The nioiguchi is wide and the suge-bôshi shows a wide ko-maru-kaeri. Based on this work, it seems as if Awataguchi Kunimitsu’s tantô are a little more nie-emphasized than his tachi. Please check out Darcy’s site here for some excellent pictures of the blade and the steel. Now there were some theories forwarded in the past that Awataguchi Kunimitsu and Shintôgo Kunimitsu were the same smith but these are dismissed today as their signature style differs significantly (note the left inner part of the character for “Kuni” and the upper part of the character for “mitsu”) (see picture 5). Well, the theory of course suggests itself as Shintôgo has his roots in the Awataguchi school but apart from the signature, the blades of Awataguchi Kunimitsu just don’t show enough chikei and kinsuji to pass for Shintôgo (the steel is different too) and they belong within the Awataguchi school to the least nie emphasized blades at all. So if you add up all kantei points for Awataguchi Kunimitsu, you arrive at: Slender tachi-sugata with a rather shallow sori and a somewhat wider shinogi-ji in combination with a nashiji or nashiji-like hada, a noticeably narrow suguha-based hamon, and a bôshi with a relative wide kaeri (see tantô in picture 4). Again, the jiba does not feature much nie what gives the blades a more unobtrusive overall appearance. There are a few blades extant by Kunisada (国定), a student of Awataguchi Kuniyoshi’s student Kuninobu (国延), but as he moved later to Ayabe (綾部) in Tanba, I want to introduce him when we arrive at this province. The same applies to Kagenaga (景長), the son of Awataguchi Yoshimasa (吉正) who in turn had studied under Tôshirô Yoshimitsu, who founded the Inaba-Kokaji (因幡小鍛冶) lineage. So we will talk about him in the course of when we learn about what was going on in Inaba province. However, last but not least I want to introduce Awataguchi Kagehisa (景久) as there is a single tantô of him known (see picture 6). In other words, there are virtually zero blades of all the other Awataguchi smiths extant who are quoted in the genealogy but who were not the famous masters of the school. So Kagehisa is said to have been the student of Tôshirô Yoshimitsu and he is traditionally dated around Kôan (1278-1288) or Shôan (正安, 1299-1302). The tantô in question is in hira-zukuri, small and elegant, and has a hardly tapering tang that tends to furisode. The kitae is a very fine ko-itame with a little nagare, plenty of ji-nie, and a little chikei. The hamon is a ko-nie-laden ko-midare mixed with ko-notare at the base, gunome-ashi, fine sunagashi, some kinsuji, and nijûba in the upper half. The bôshi is midare-komi with a ko-maru-kaeri with hakikake. The blade features a very bright nioiguchi and Satô Kanzan speaks of it “as might be excepted, of high quality.” In short, it fits into the legacy of the Awataguchi school and the tradition that Kagehisa had learned from an outstanding mastersmith. Also backing the tradition is the noticeable tendency towards midare in the ha and towards furisode in the nakago. 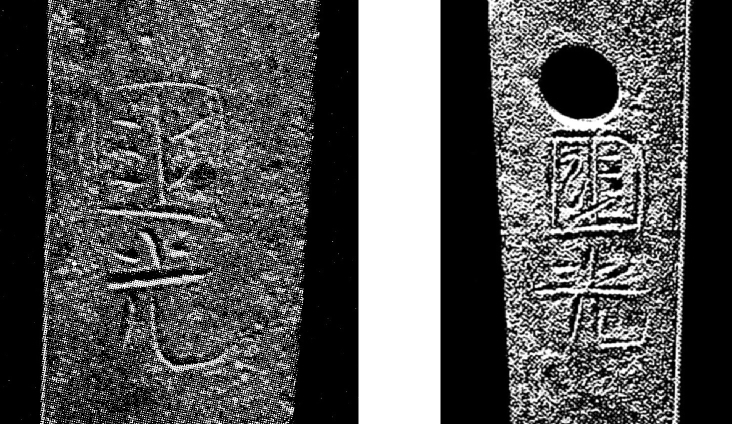 The latter shows kiri-yasurime and a small and quite finely chiselled niji-mei. It is difficult to say how or if at all the Awataguchi main line was carried on after Yoshimitsu. Incidentally, if we count Kuniie (国家) as first generation Awataguchi, Yoshimitsu would have been the fifth generation main line. The school itself had existed for about a century at the time of Yoshimitsu. Well, before I come up with some attempts at explanation, I want to introduce what the historic sources say about what was going on after Yoshimitsu. In the earliest extant sword publication, the Kanchi’in Bon Mei Zukushi, there isn’t any mention at all in this respect and Yoshimitsu is even listed in line with Kuniyoshi and Kunimitsu. Therein the main line goes Kuniie → Kunitomo → Norikuni → Kuniyoshi, period. Yoshimitsu is seen as contemporary or, if you want, as younger brother of Kuniyoshi. In the Kokon Mei Zukushi, Yoshimitsu is succeeded by Nobumitsu (延光) who again has four smiths under him, Masamitsu (正光), Yoshimasa (吉正), Yoriie (頼家), and Kunisumi/Kunizumi (国純), although it is not mentioned who his official successor was or if one of them succeeded him as head of the Awataguchi school at all. Tsuneishi introduces in his Awataguchi genealogy two students of Yoshimitsu, namely Yoshikuni (吉国) and the aforementioned Kagehisa (景久). And the Kotô Meizukushi Taizen lists Masamitsu, Yoshimasa, Nobumitsu, and Kunichika (国近) below of Yoshimitsu. Let us focus on the tradition of handing over one character to the next generation for a little. When we look at the Awataguchi genealogy we learn that in many cases, the first character of the master’s name was used as second character of the successor’s name, e.g. KUNItomo → NoriKUNI → KUNIyoshi → YoshiMITSU or AriKUNI → KUNIhisa. So in the case of Yoshimitsu, we would expect some name like MITSUxxx. Interestingly, the Kotô Meizukushi Taizen says that Masamitsu also signed with Mitsumasa. A Yoshimitsu student with the name Mitsumasa is not found in the meikan but when we look at the Masamitsu we come across Daruma Masamitsu who is said to have been the son of Daruma Shigemitsu (重光). Well, both Masamitsu and Shigemitsu are dated around Eitoku (永徳, 1381-1384) but lo and behold, there exists the tradition for Shigemitsu that he was the son of Awataguchi Yoshimitsu. But we must be careful. Genealogies were pimped or doctored later on exactly that way, that is, having a smith working in Yamashiro province who shares the same character as a famous master smith tempts the compiler to create this very connection in the first place. So basing a theory just on limited genealogic data can mean falling right into the trap of the compiler. In other words, when you start from a certain smith and go downwards you might just follow what was actually created by a compiler by going backwards. How about the branches of the other masters of the school? Not many students are recorded for any of them, except for Yoshimitsu’s predecessor Kuniyoshi and for Kunitsuna, the youngest of the earlier Six Awataguchi Brothers. As mentioned, one branch that had emerged under master Kuniyoshi relocated to Tanba province and flourished there throughout the Nanbokuchô period (also by being joined from a branch of the lineage of Yoshimitsu’s student Masamitsu which had moved to Tanba too). And the school of Kunitsuna brought forth Shintôgo Kunimitsu who was one of the founders of the Sôshû tradition as Kunitsuna himself had moved to Kamakura on bequest of the bakufu. The downfall or rather discontinuance of the Awataguchi School is most likely linked to the fact that the Kyôto-based and highly prestigious lineage was mainly producing for a clientele that came from local aristocracy and highest circles. So by the time of Yoshimitsu, i.e. late Kamakura, the school was facing a Kyôto of an aristocratic class that had reached a point at which its political obsolescence, that came along with the establishment of the Kamakura-bakufu in 1185, had been pretty much noticeable. Of course, Kyôto was still undisputed center when it comes to refined culture, connection to the Chinese mainland, and sanctioning of courtly titles, and traffic between the imperial capital and Kamakura was heavy. Another severe impact on the ability of the Kyôto aristocracy to put anything into practice came with the two invasion attempts of the Mongols which tooks place in 1274 and 1281. We all know that “favourable” weather conditions played an important role in the defeat of the invading fleet but as the bakufu was responsible for national defence, it took large parts of the “victory” on it’s own account. In other words, the Shogunate in Kamakura was so to speak capable of not only defending but also of being in charge of the country. Accordingly, the local Kyôto smiths were about losing a great amount of business and much more promising was what was going on in Kamakura and the newly established Sôshû tradition of sword making. But on the other hand, another Kyôto-based school, Rai, was just about to flourish (and became as successful as it gets). So there was surely a demand left. Anyway, what we can see is that from late Kamakura onwards, a significant shift from noble to martial took place and maybe the Rai School was just more capable of responding to this request. Well, there are still many things in the dark when it comes to the early Kyôto schools. Maybe there were other, i.e. local and/or genealogic factors involved than mere the factors supply and demand and rise of the warrior class. For example, we are still not able to fully connect the dots and draw the connections between Sanjô, Gojô, Ayanokôji, Awataguchi, and Rai. I mean, overlapping workmanships give us a pretty good good hunch about that they must have been somehow connected. But we don’t know for sure which schools’ founder was trained by whom and so on. And with this, I want to close the chapter Awataguchi and move – with a short stopover at Aburanokôji (油小路) – over to the Rai School.